PENSACOLA, Fla. — The Center for Information Warfare Training’s (CIWT) Language, Regional Expertise and Culture (LREC) directorate continues to offer valuable resources for Navy personnel and their families. All LREC’s resources support the Ready Relevant Learning (RRL) initiative of Sailor 2025 by delivering the right training at the right time, in the right place and in the right format for our Sailors. One resource is Every Deployment is a Global Engagement, better known as Navy EDGE. Deployed on Navy e-Learning, Navy EDGE courses deliver training on the importance of understanding foreign cultures, in general, and orientation to specific cultures of interest to the Navy. Deployed in early 2018, Navy EDGE courses are available for the five overseas fleet concentration areas: Bahrain, Italy, Japan, South Korea, and Spain; and also available in three nations of strategic interest: China, Iran, and Russia. Nation-specific courses are supplemented by printable working aids. These courses are intended to train personnel to recognize culturally-driven behaviors and social norms unique to a foreign culture and to shape learners’ attitudes and behaviors to promote international good will and understanding. The courses also reinforce the Navy’s core values and their applicability to duty overseas. Personnel preparing for overseas assignment should first complete the culture general courses in the Navy EDGE suite, Cross-Cultural Competence course (3C) and Culture Shock. C3 introduces the concept of culture and describes how effective cross culture communication can be a mission enabler. The course prepares the learner to adopt a diplomatic mindset through the application of cultural knowledge, skills, and abilities to deploy, adapt, interact, and succeed in a multitude of worldwide missions, regions, and cultures. The Culture Shock course introduces the concept of culture shock, explains its potential effects and how to identify it in yourself and others, and provides avoidance and coping strategies. When these courses are combined with country-specific training, Sailors, civilians, and their family members will be better prepared to live and work overseas. Each course also includes a video presentation for group learning, a professional etiquette guide and a culture card that provides a short summary of the host country’s culture. These courses satisfy standing orders to maintain cultural awareness. Commanding officers may use EDGE to ensure their crews maintain cultural awareness which improves unit and personal readiness and operational outcomes. All of the courses are available on Navy e-Learning and Navy e-Learning Afloat. Another top resource is the Navy Global Deployer application for mobile devices. 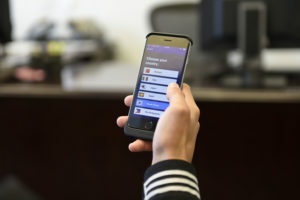 The app is designed to support Navy personnel and their families stationed or deployed abroad with cultural awareness and foreign language resources. It provides resources on language, history, geography, people and ethnic groups, religious institutions, societal norms, culturally-driven individual behaviors and etiquette, and culturally-appropriate behaviors. The predominant cultures of 27 countries are currently available with 30 more being added by the end of 2018. The app includes operational cultural orientation and language familiarization training content including videos, culture cards, etiquette guides, common language phrases, and self-paced language learning guides. Cultural orientation materials are comprised of narrated videos providing in-depth information on a country’s history, language, social norms, culturally-appropriate and taboo behaviors, and more. The culture cards are guides for a specific country summarizing much of the information presented in the corresponding training presentation. Most include a guide to each country’s naval rank structure and insignia. The etiquette guides offer cultural norms for meeting and greeting, the significance of common nonverbal gestures, and other useful information. The app is available for download from the iTunes and Google Play online stores. To find the free app, search key words such as “CLREC” and “Navy global deployer” in the app stores or a web browser. Sailors can also find this app and many other Navy apps at https://www.applocker.navy.mil. The Navy’s LREC office delivers foreign language instruction and training on foreign cultures to prepare Navy personnel for global engagements to strengthen ties with enduring allies, cultivate relationships with emerging partners, thwart adversaries, and defeat enemies. Part of the Center for Information Warfare Training, LREC directorate is located onboard Naval Air Station Pensacola Corry Station. For more information, contact LREC at culturetraining@navy.mil or languagetraining@navy.mil or 850-452-6736, DSN 459. Center for Information Warfare Training delivers trained information warfare professionals to the Navy and joint services, enabling optimal performance of information warfare across the full spectrum of military operations. For more news from Center for Information Warfare Training enterprise, visit http://www.navy.mil/local/cid/, http://www.netc.navy.mil/centers/ciwt/, http://www.facebook.com/NavyCIWT, or http://www.twitter.com/NavyCIWT. © 2018 ACGE. All Rights Reserved.